Looking for a versatile tuning system that will grow with your modifications? Need to program a newer 6 or 8 speed car or truck, but aren't able to meet up for our in person event? Would you like to be able to return the vehicle to stock before taking it in to the dealer for service, all but eliminating the likelihood of any warranty concerns? If the answer to any of those questions is YES, then our AutoCal is just what you have been looking for! All tuning with our AutoCal is custom designed specifically for your vehicle, your modifications and your desired tune changes. We start off by having you collect your OEM tune file(s) as well as a scan of the vehicle's operating conditions while driving. Those items are sent in to us for diagnostic review and to build your tune files. Assuming all is acceptable to proceed, we then provide you with your custom files built for your vehicle. Copying and flashing those files takes just a few minutes. Multiple vehicle licensing available on a single device! 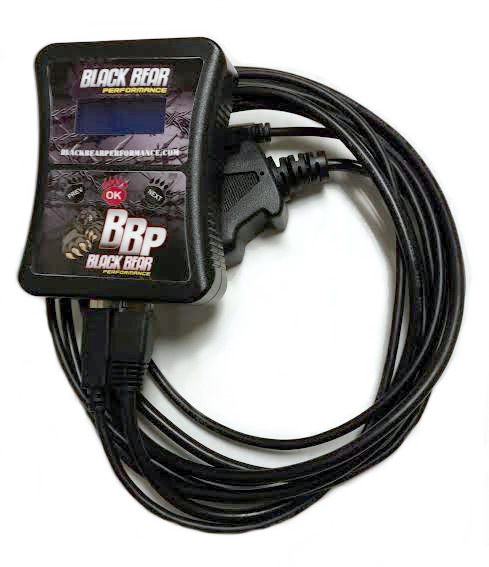 Up to 221 vehicles can simultaneously be tuned by a single AutoCal device with the purchase of additional service from Black Bear Performance. No other handheld offers this flexibility. AutoCal software runs on Windows Only, however a laptop is not required. Each AutoCal device will be sold with tuning service included. "Bare" units are available to existing customers at an alternate price. Existing customers that have purchased replacement computers may trade those computers in towards the purchase of the AutoCal. Please contact us directly for more details. Additional vehicle tune purchase price is $325, which includes the tune service and software license. For each vehicle tuned, we will provide updates on an as-needed basis at no additional cost. We reserve the right to modify that policy as we see fit and will notify all affected parties. Due to a change in the security protocol implemented by GM for all 2017+ models, there is an additional cost associated with accessing those computers. There are additional steps needed before any tuning can take place and the process can take a few days longer as a result. We apologize for any additional difficulty this adds, but it is outside of our control.